2013 December | chesapeaketidings & more.. 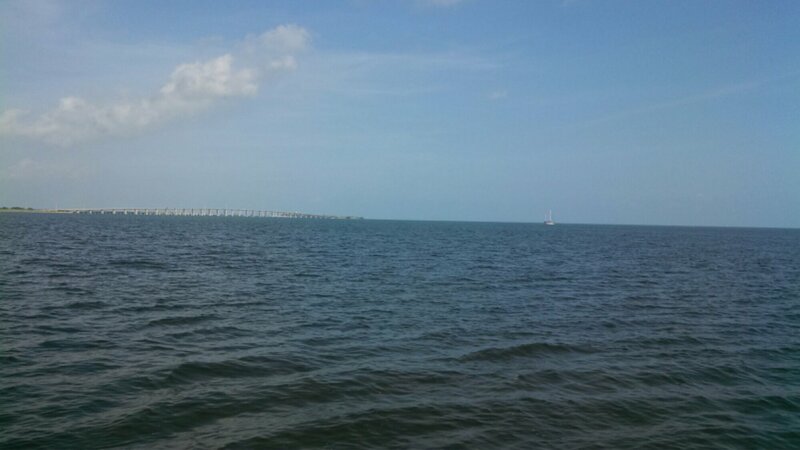 The last 100 miles was a pleasant three days running down Hawk Channel on the east/south side of the Keys. Well protected by the outside reef, and with moderate winds, it was a nice change of pace to have sails up. Arrived in Key West Harbor on Tuesday (12/17). Coming into new, unfamiliar territory is always a bit tense. But good friends had made a connection for me with a convenient and inexpensive mooring. One call to the owner returned lat/long and a description that took me there easily. It is re-assuring to know the boat is secure, especially with the frequent, high winds that blow this time of year. My friends also opened their home as an ‘on-land’ base so I don’t need to make daily dingy trips between boat and land. Those trips are frequently very wet when winds blow above the low teens and other boat traffic creates significant chop. Add to that, they have included me in an assortment of fun, Key West social activities including Christmas parties, cook out, artist’s mart and upcoming New Year’s dinner. It has been busy! One notable party was at Casa Antigua, an historic hotel turned into a private residence. The owner has an open house for the community each year with incredible foods and open bar. The decorations were spectacular. Only down side has been some issues with the dingy outboard. The first created by my forgetting to re-attach the fuel line – rookie mistake that resulted in a very long row to get back to the boat from the city dingy dock. The second appears to have been an air block that was solved quickly and inexpensively by a local engine repair service. Weather has been warm to hot and breezy, pretty normal for this season. I’m looking forward to getting familiar with the town and its history, as well as several unique aspects/activities that define Key West and make it such an attraction. And yes, I did get the required photo of Mile ‘0’, the southernmost point. Looking forward to Race week in January and a sail out to the Dry Tortugas… more and pics later. I’m anchored this evening in Long Key Bight on the edge of the ocean at a point further south than I’ve ever had the opportunity to go. In two days I’ll be the rest of the way south – at Key West. The moon – nearly full – has lit up the water. My view to the east is unobstructed across the stream to the Bahamas – may get there before heading home. The water is calm and lapping at the boat. Only some distant traffic occasionally breaks the quiet. With luck, and an accurate weather forecast for a change, looks like a sailing day, and maybe two the rest of the way down Hawk Channel. A special thanks this evening to the woman I love, who gave me the freedom to find this place and the adventure it is part of. How quickly it all passes, and experiences merge into a blur, It takes some concentration and organization to keep it all in sequence. Writing for this blog helps…. so, from the last report at St Mary’s and the stop at Jim King Park that prompted the ‘Solo’ post, I’ve traveled to St Augustine ( on a mooring), Daytona, Titusville (near Cape Canaveral), Melbourne (anchor), Vero Beach Marina (2 nights on a mooring), Rafted with friends near Stuart, anchored at Riviera Beach (met a fellow Catalina 30 solo sailor), stopped at Loggerhead marina just north of Miami (needed a shower J ) and visited with the Lasata crew, anchored at Hurricane Harbor just south on Miami, and sitting now at Anchorage Resort & Yacht Club after a loooong day with high winds..
An aside –I’ve been amazed at the evidence of incredible wealth apparent in the homes along the waterway. Mansion after mansion of 5-10,000 sq ft and larger homes with mega yachts parked in front. One wonders where all that wealth comes from. Red 44 was passed on Monday, 12/9 – thousand mile mark from Norfolk! I’ve enjoyed the connections with other cruisers as we pass and re-pass each other along the way – and often stop to help when someone has boat problems. Today was the first of the ‘multiple bridge’ days, and the challenge to maintain a pace between to avoid long delays while waiting for a scheduled opening of the low bridges. Vero Beach was a rest stop and a chance to re-provision. Friends Sue and Bill from back home are now staying there in a beautiful motor home, but remain connected to the cruising community that is extensive at Vero. So, I got a trip to the grocery store and re-provisioned for the next couple weeks – likely the last such stop before Key West. The stop at Stuart was the first chance to catch up with cruiser friends Chuck & Cathy, and I got treated to a small feast for dinner and the chance to share stories and their experiences for the places I have still to see. From Stuart it was a quick run to an anchorage at Boca Raton where I met Moby a fellow Catalina 30 sailor (bet you can guess his last name – Richard , also cruising solo on Allegro. We spent a pleasant evening sharing experiences. This is the first trip south for both of us, and we’re both headed to Key West, so are traveling together for a time. He’s in the smaller boat…. An interesting run past Miami, but just as glad to see it in the rear view mirror. The past two days have been sunny but very high north winds blowing 15-25 knots making for uncomfortable motor sailing with following seas. Seems wind is a sailors best friend and worst enemy. After two days of anchoring difficulties and these winds, I opted for a marina tonight……… shower time and a good night’s sleep! Just about 100 miles to go to Key West! Tonight I found myself in a solitary anchorage after a long, pleasant run of 48 miles. The day began with the promise of warming, sunny weather – a promise kept. It is also a reminder of the contrasts. Solo sailing has its joy, and offers time for contemplation as well as the meeting of challenges when conditions are less than ideal. Perhaps more important, it misses the opportunity to share the very special times and places one encounters unexpectedly. Tonight was one of those. As the sun set, the sky glowed with vivid salmon colors against the blue. I’d post a picture, but it wouldn’t begin to convey the spectacular changing view. This evening will be one of those solo times etched forever in the memories of this adventure. As the sky keeps changing, and the birds continue their evening songs, I’m reminder of all I’d hoped for in making this trip,and look forward to the remembering and other opportunities to share. … maybe I’ll post a pic or two later………. After dropping Carl off in Charleston I headed off to Savannah. It was just a couple days travel time with good weather on down to Savannah when Terri – a friend from Key West was to meet me and crew for a week to Jacksonville. Charleston was a nice marina facility and close to stores for some resupply. Sailing friends on Lasata, Ralph and Stacie were also there. We both headed out a bit latter in the morningon the 15th and made about 20 miles to an anchorage in Church Creek (stm 487) where we rafted for the night. Then on early the next morning to Beaufort. First encounter with the bootom coming our of the Ashepoo-Coosaw cutoff…. Zigged right instead of left and stopped. Fortunately the power boat behind me took a line and I was free in just a few feet. It was an uneventful trip to Savannah where I had arranged with the Hinkly Yacht Yard to replace the leaking raw water pump. What terrific folks. They did what they promised, did it on time and with considerable consideration in the form of free dockage for part of the few days there. Terri joined the boat in Savannah. We made the first 32miles to KilKenny Creek, and a ‘fishing camp’ style marina? A bit rough around the edges, but a well protected spot and friendly folks. The next day we made about 40 iles to an anchorage in South River (stm 653). This marked another day of high north winds and chilly temps…..weather that was going to hound us all the way to Jacksonville. Weather drove us into a marina at Jekyll Harbor. Other than the cold, wet, high wind conditions, we made the trip to St Mary’s in good time. Each year the town of St Mary’s hosts any cruisers in the area to a Thanksgiving dinner and associated events. Good food and good company! and a lot of folks (2-3 hundred) to feed! The town has a very long history dating back to the 1700’s. We had some time to wander and found the cemetary. We stayed an extra day to enjoy some of the cruisers’ company and make new friends. Also, the next day’s forecast promised light winds and warmer – just one of the misguided forecasts…. Instead we encountered 20-30kt winds and a high temp in the 40s. It was NOT a fun trip across the St Andrew Sound and down to a free dock just outside Jacksonville. With 25kts of wind directly on the dock, we pulled up, stopped the boat the the wind carried us broadside into the dock. There would be no leaving until the wind subsided. This AM it was nearly calm. Three other boats that had been pinned here for two days, left early and I was alone on the dock. We met an amazing man here named Brown, who Mark Doyle had told us about. He’s as sailor, retired and has lived in the area for over 30 years. He volunteers his help to passing sailors as a way to give back, or pay forward, however you think about it. He gave Terri a ride to the airport (45 min drive), and took me to stores to pick up some supplies – never asking or expecting any compensation. We donated as our ‘pay forward’, as I hope others do/will to support his good work! When I got back from errands, another sail boat from Michigan had arrived. After helping them turn the boat around in the fast current, they invited me for dinner. I continue to be amazed at the commuity of sailors and how quickly friendships are formed. It is so far, one of the highlights of the trip.